We'd like to wish each of you a very Happy Mother's Day! Enjoy the day and time with your families and those you love. We have a few new things we'd like to share. 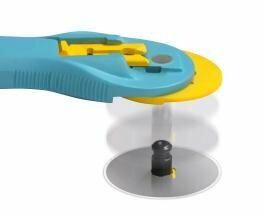 Olfa has designed a new rotary cutter and styled it in a pretty spring blue. It features a great shape for the perfect grip . . . and . . . it has a new quick change blade feature. Simply slide the blade-lock down to release and replace an old blade, slide the lock up and it is ready to go again. A very nice improvment! This year one of our Saturday Sampler projects is a series of three projects! 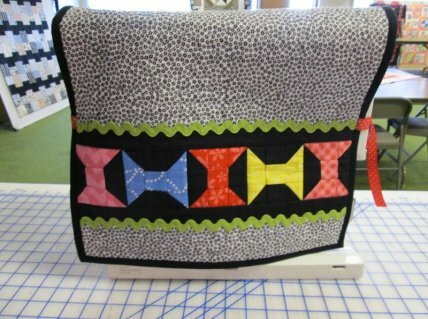 We are starting on a new tri-mester and began today with a sewing machine block. We show a variety of things that can be made with the Saturday block. 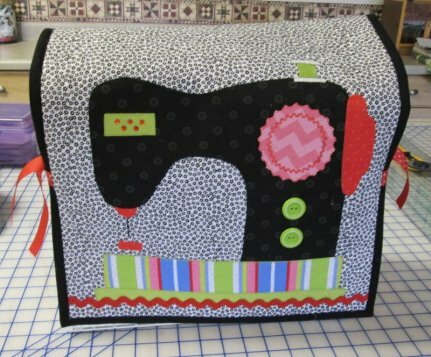 For May we are sharing a sewing machine cover, notice the cute "spools" on the back. We have kits available, they include everything; buttons, binding and backing. 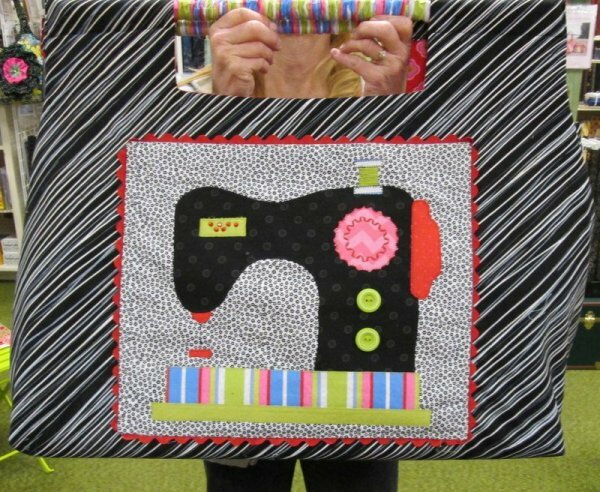 This would make a nice gift for a quilting or sewing friend. . . not to mention your very own little self! And another idea for the block is this giant bag for carrying supplies to class or to a retreat or other fun quilting occasions. The sewing machine block forms a pocket on the bag front. There is a covered bolt in the bottom, used for stabilizing the bag and for an ironing surface in class. Very smart . . . another nice project for yourself or someone who is always "caught up in stitches". And speaking of terrific projects, here is a darling adult size apron, the pattern is named Strawberry Licorice. Diana made ours in black, white, pink and purple. It is striking and fun to wear. You might also want to see two other new apron patterns, Punch and Cookies and Lime Rickey. Just wanted to share a bit of what is new. Have a great weekend and hope to see you soon!